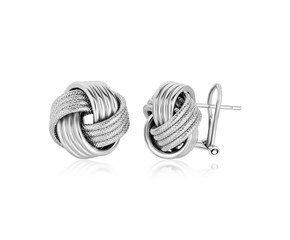 A darling pair of omega back stud style earrings showcasing a groove texture love knot design. Made of rhodium plated sterling silver. Ideal gift for someone special on valentine day or for you own jewelry collection. All orders are processed within 4 business days. We use USPS as shipping carrier and offer both priority starting at $5.99 and Express starting at $19.99. If for any reason, you are not happy with your purchase, please reach out to us in 3 business days of receipt of your order. Any origination shipping is not refunded for any returns unless the product was damaged or defective. This item in Silver Jewelry category was first added to our catalog on 06-06-2016. Buy Love Knot Stud Style Silver Earrings, sold & shipped by Kulvir where you can shop online for Traditional Indian & Contemporary Jewelry in Latest Style. This Jewelry & Accessory collection has been tagged as valentine gift, silver earrings, jewelry, stud silver earrings.